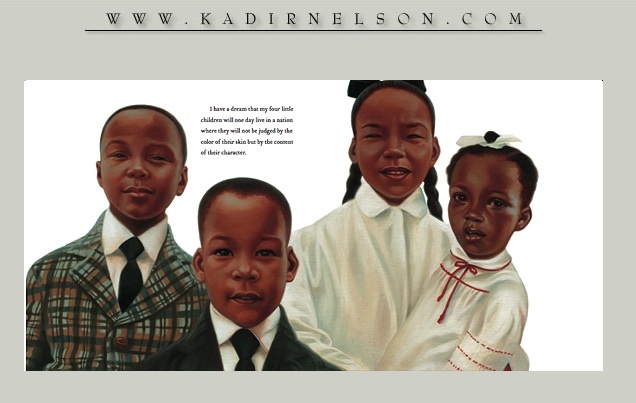 The Relished Roost: The Beauty of Kadir Nelson's " I Have A Dream"! 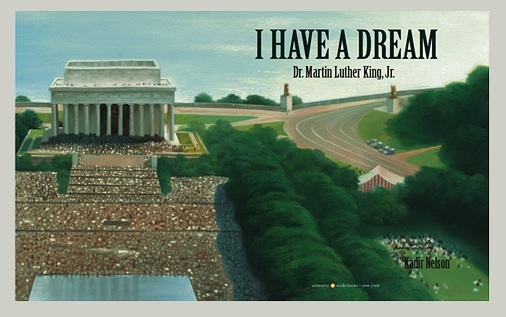 The Beauty of Kadir Nelson's " I Have A Dream"! 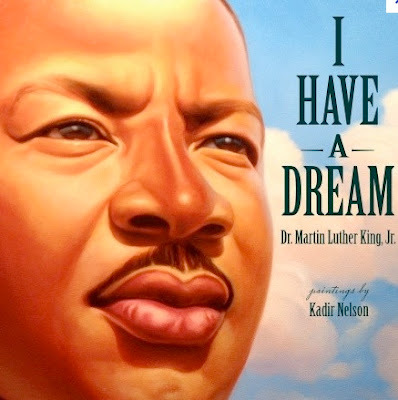 There is a beauty and timelessness to the speech ”I Have A Dream” by Martin Luther King. I think it resonates with all walks of life and to those who struggle to overcome obstacles while seeking to be seen and heard as a person who matters on this planet. I am so happy to see a book that is a true piece of art that represents this wonderful speech! The Book” I Have A Dream” by Kadir Nelson is a beautiful example of the artist’s passion for peace and equality and a stunning tribute to the late great Martin Luther King Jr. I have always loved Kadir’s art, and receive regular emails about the latest tours and works of this great African- American Artist! 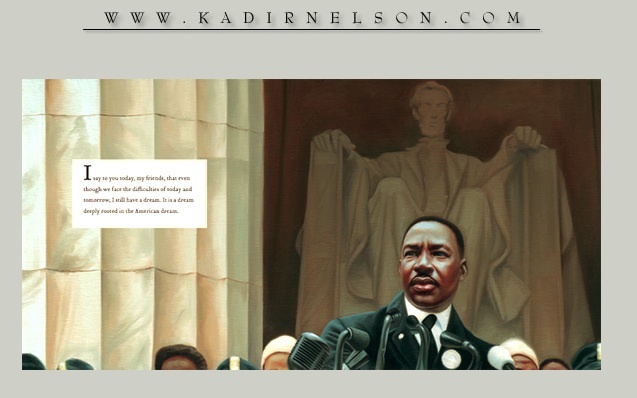 Kadir was born in Washington DC, attended Crawford High School in San Diego California and graduated from Pratt Institute in New York where his artistic talents ripened and became truly recognized. 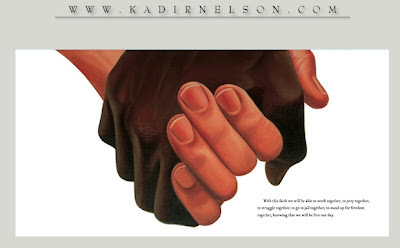 Kadir Nelson also exhibited his work in galleries and museums throughout the country and abroad including the Simon Weisenthal Center, Museum of Tolerance and the Academy of Motion Pictures and Sciences in Los Angeles, The Museum of African American History in Detroit, The Smithsonian Anacostia Museum in Washington DC, The Society of Illustrators and the Studio Museum in Harlem, New York, The Bristol Museum in England, The Citizen's Gallery of Yokohama, Japan and the Center for Culture of Tijuana, Mexico. Many of his paintings can be found in the private collections of actors, professional athletes and musicians including Debbie Allen, Denzel Washington, Will and Jada Smith, Ananda Lewis, Jalen Rose, Spike and Tonya Lee, Terry Lewis, Ray Allen, Venus Williams, Queen Latifah and Ice Cube. 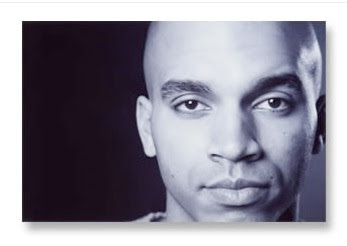 His paintings have also decorated the sets of television sitcoms "The Fresh Prince of Bel Air" and "The Jamie Foxx Show," as well as feature films "Friday,” "Set it Off" and the forthcoming “The Beauty Shop.” Most notably, Kadir Nelson was the "Conceptual Artist" for Steven Spielberg's feature film, "Amistad," and the Oscar nominated animated feature "Spirit: Stallion of the Cimarron." 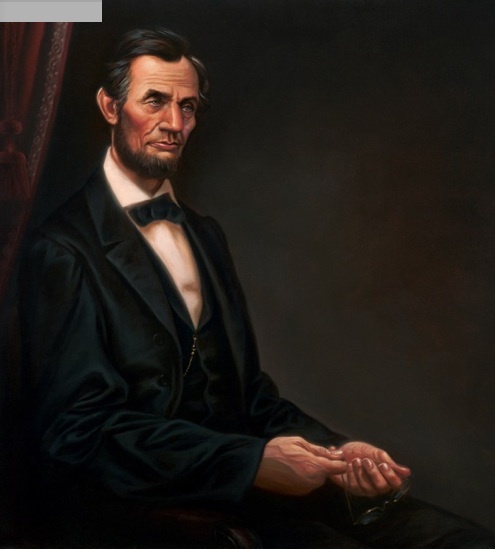 I also love his limited edition Giclee of Abraham Lincoln, which is so fitting for this time in our lives. 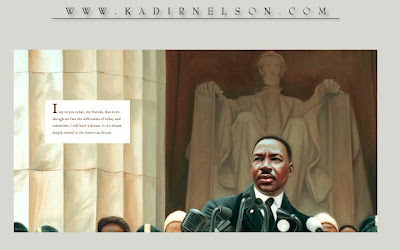 Please look up Kadir if you do not already know him, and take in the beauty of his amazing paintings! I have a dream that someday I may have one of my own! Wow. Nice paintings. I'll look up Kadir.